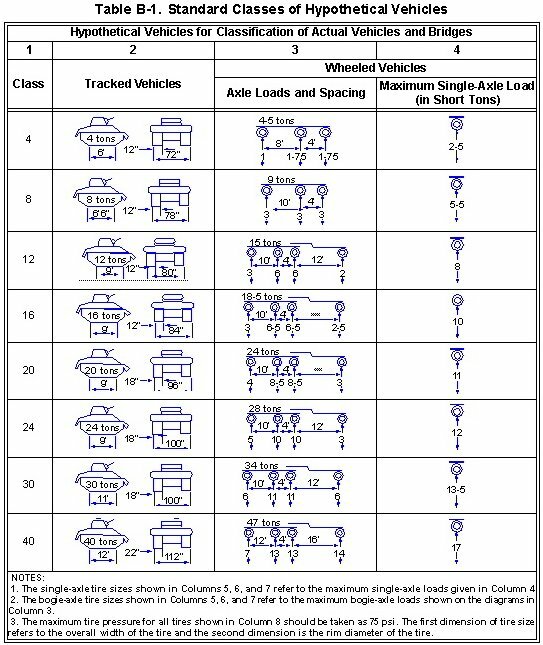 Vehicles are assigned MLC numbers, which represent the loading effects they have on a bridge. The MLC does not represent the actual weight of a vehicle. It represents a combination of factors that include gross weight, axle spacing, weight distribution to the axles, and speed. All standard Army vehicles and special equipment that are active in the TO and that use bridges of military importance have an MLC. Trailers that are rated with a payload of 1 1/2 tons or less are exceptions. They have a combined classification with their towing vehicle. Classifying vehicles, trailers, or vehicle combinations with a gross weight of 3 tons or less is optional. 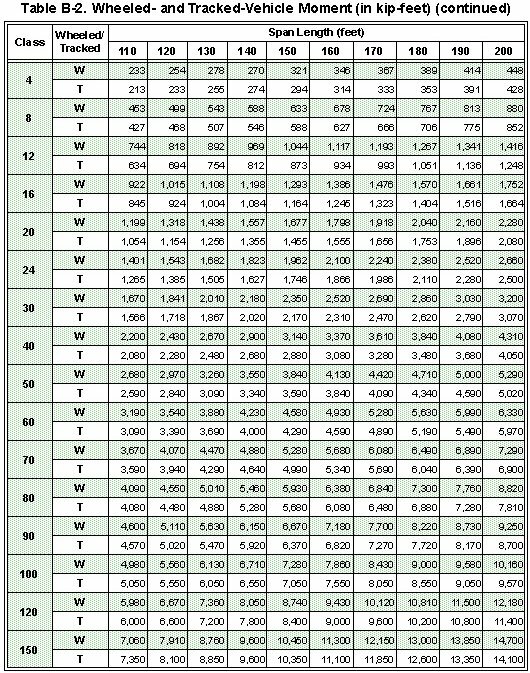 FM 5-170 lists classification numbers for most standard US military vehicles. To get the classification numbers for unlisted and nonstandard vehicles, submit load and dimensional information to the US Army Research and Development Center according to the instructions in FM 5-170. Expedient classification procedures for emergency situations are explained in this appendix. B-1. Table B-1 shows 16 standard classes of hypothetical vehicles ranging from 4 to 150. The weight of the tracked vehicle in short tons was chosen as the classification number. A single-wheeled vehicle has a weight greater than its classification number. 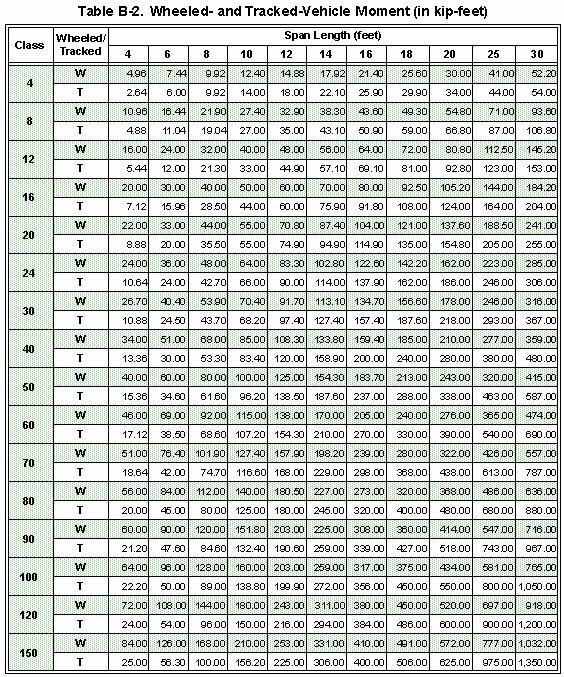 Each classification number has a specified maximum single-axle load. Also specified are the maximum tire load, the minimum tire size, and the maximum tire pressure. The classification numbers were originally developed from studies of the hypothetical vehicles having characteristics about the same as those actual military vehicles of NATO nations. B-2. 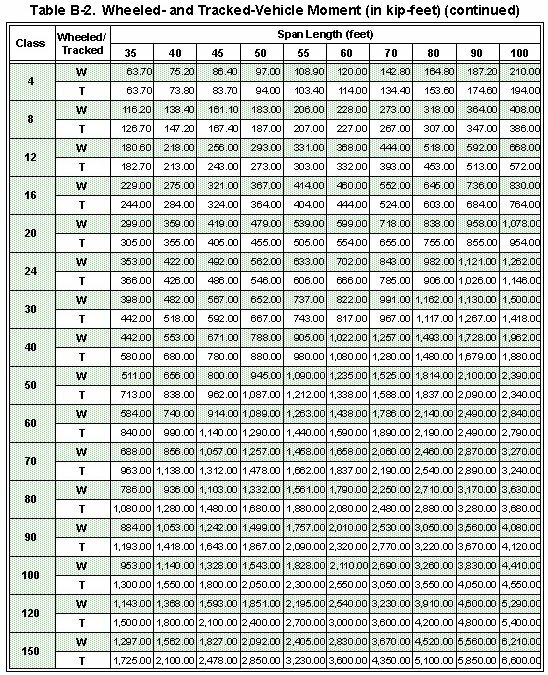 The moment and shear forces produced by the hypothetical vehicles or single-axle loads are provided in Tables B-2 and B-3. These figures are based on the assumption that the nearest ground contact points of two different vehicles (wheeled or tracked) are 100 feet apart. 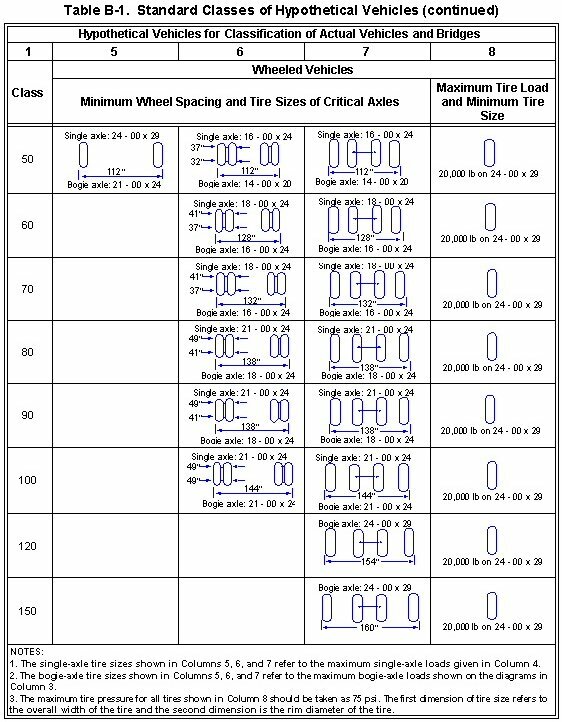 Table B-1 gives critical tire loads and tire sizes. B-3. 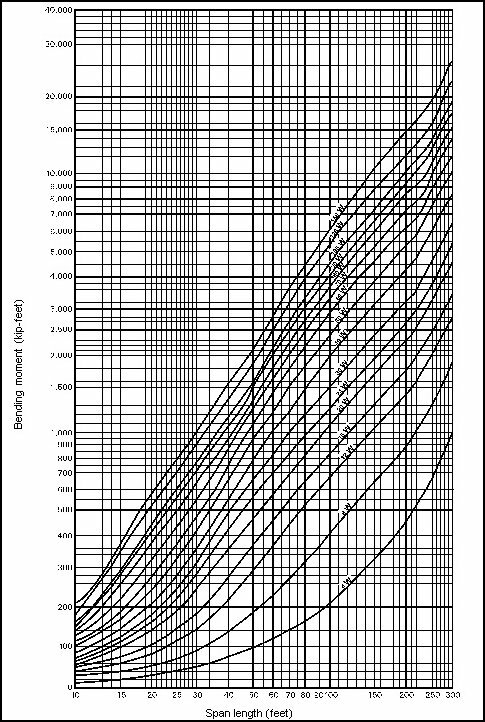 Standard classification curves were developed for classifying vehicles, for designing nonstandard bridges, and for estimating the capacity of existing bridges. 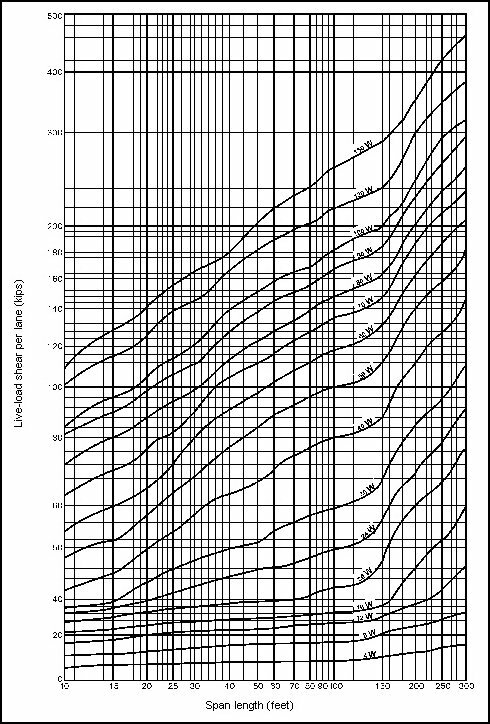 Each standard class has a moment and a shear curve (Figure B-1 and Figures B-2 through B-4. The maximum moment and shear forces were induced against the simple-span lengths by the hypothetical vehicles for each standard class. These forces were plotted to determine the curves. 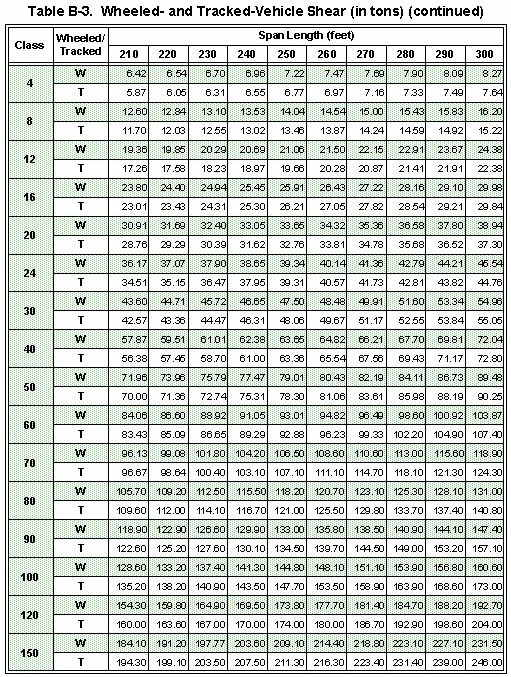 The actual values for the curves are found in Tables B-2 and B-3. 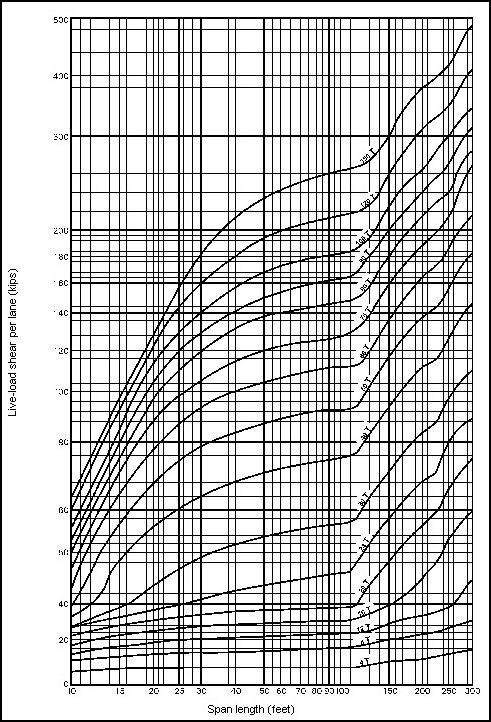 Note that in the curves, shear is represented in units of kips; however, in Table B-3, shear is represented in units of tons. No allowance is made for impact, and the assumption is made that all vehicles will maintain the normal convoy spacing of 100 feet between ground contact points. B-4. Use the analytical method for classifying nonstandard or enemy vehicles in the TO. Standard vehicles are normally classified using FM 5-170, but if necessary, use the analytical method to classify standard vehicles. Load on each axle (empty and loaded). Load on the fifth wheel, pintle, and so forth (empty and loaded). 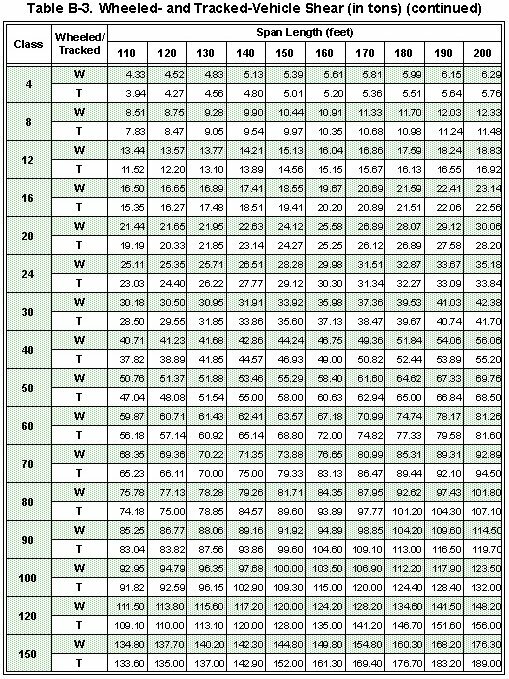 Tire size and pressure per axle. 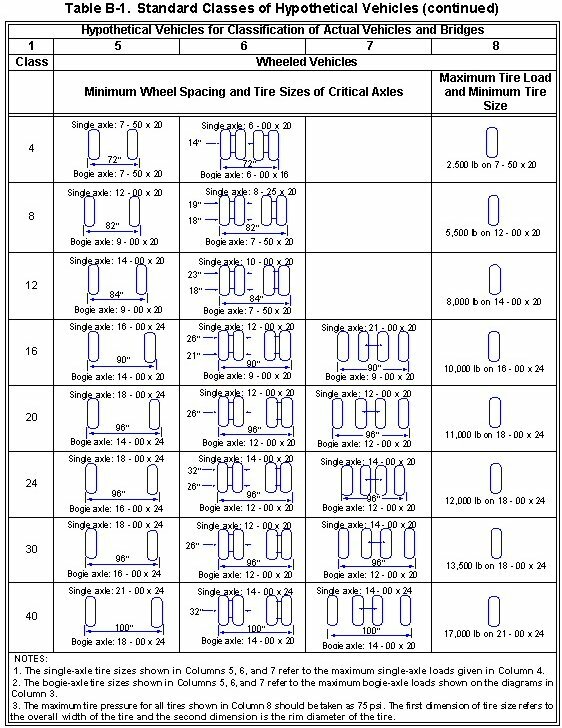 Number of tires per axle. 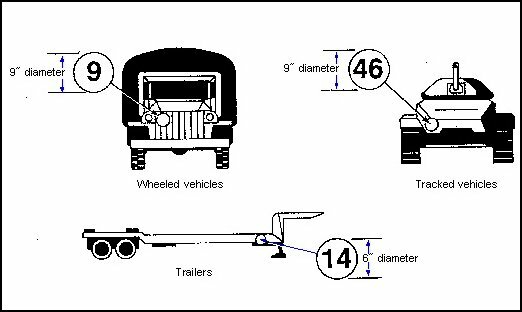 Distance from the pintle or fifth wheel to the nearest wheel. Width (outside-to-outside) of the tires or tracks and width (inside-to-inside) of the tires or tracks. Length of the track that is in contact with the ground. Step 1. Compute the maximum moment (in kip-feet) produced by the vehicle on each of five or six simple spans of different lengths between 10 and 300 feet. Step 2. Use Figure B-1 to plot the moment and span length of a wheeled vehicle, and use Figure B-2 to plot the moment and span length of a tracked vehicle. Assign a class number by interpolating between the curves at the point where the class number is the largest. Step 3. Compute and plot the shear points on the curves in Figure B-3 or Figure B-4. Assign a new class number if the class is higher because of the shear. Step 4. Use Table B-1 to compute the hypothetical width by linear interpolation between standard hypothetical vehicles. Step 5. Compare the actual and the hypothetical widths. 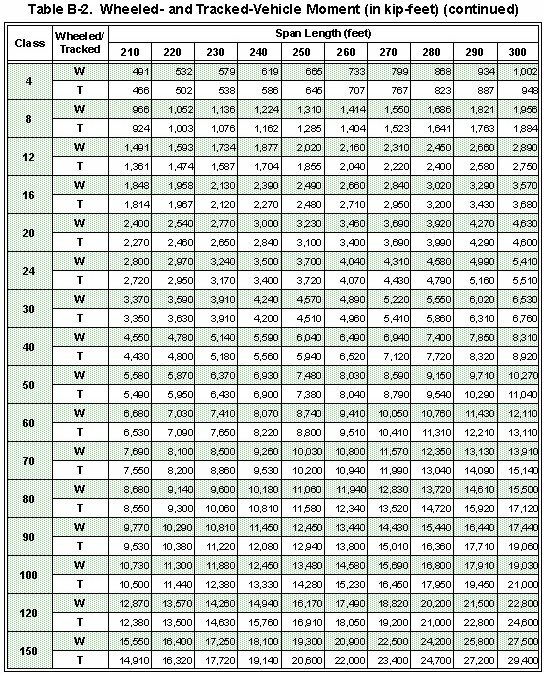 Then increase or decrease the class number by the percentage given in Figure B-5. B-7. 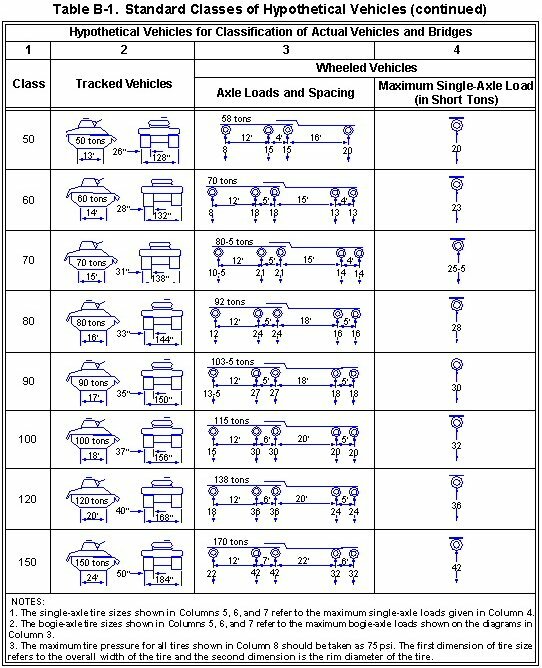 Increase the classification if the vehicle's outside-to-outside track or tire width is narrower than the corresponding hypothetical vehicle. 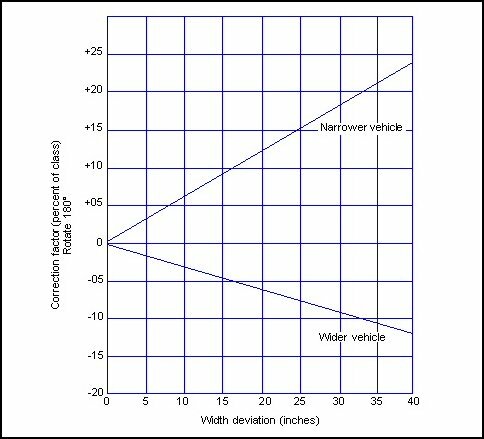 Decrease the classification if the vehicle's outside-to-outside width is wider than the corresponding hypothetical vehicle. 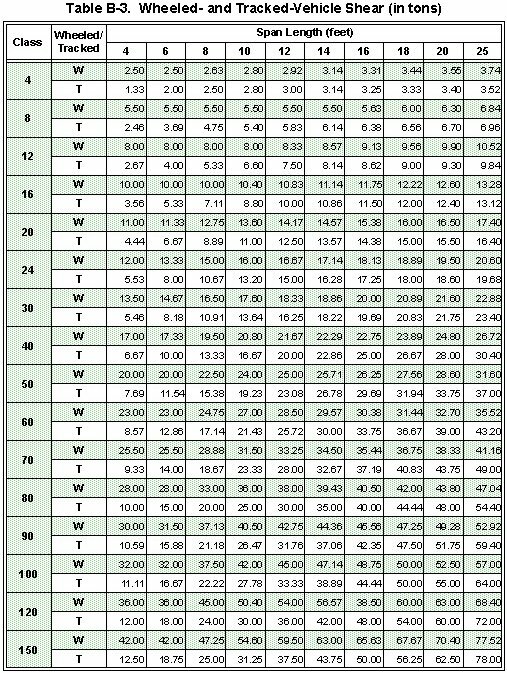 The maximum axle or tire load of the vehicle may exceed that given in the hypothetical vehicle chart (Table B-1). 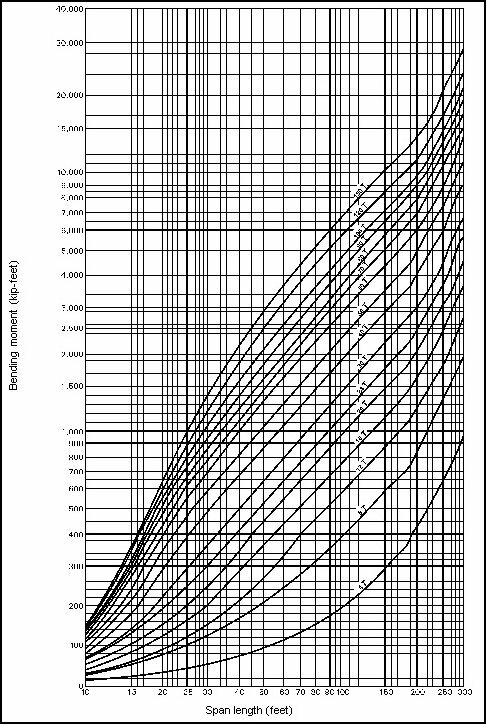 If it does, increase the class to that of the hypothetical vehicle of the same maximum axle or tire load, interpolating between the values in the chart if necessary. 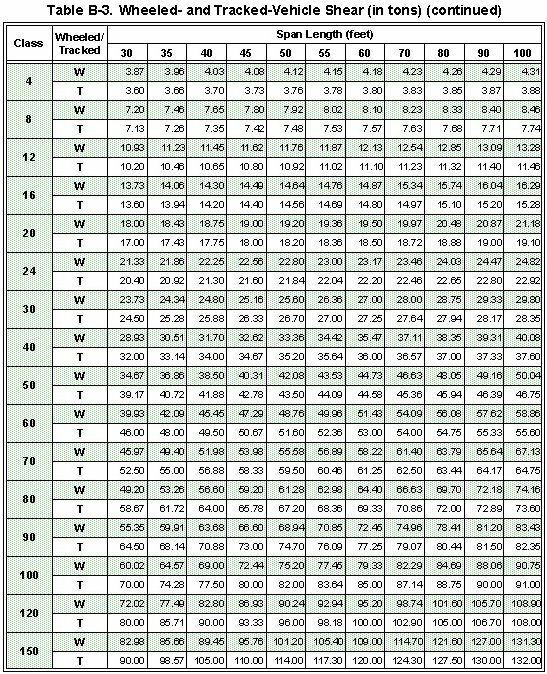 Round the final classification up to the nearest whole number. B-8. Use expedient methods to classify vehicles in an emergency. To obtain a permanent classification, however, reclassify by using the analytical method as soon as possible. FM 5-170 provides guidance for this purpose. B-9. Vehicles are divided into two categories for classification purposes-single and combination. B-10. A single vehicle has only one frame or chassis (Figure B-6). Examples are trucks, tanks, trailers, and gun carriages. Single vehicles are assigned a class number that is rounded up to the nearest whole number. All vehicles except trailers have front signs to show their classifications when loaded to the rated capacity. For unloaded or overloaded vehicles, adjust the front sign to show the actual load classification. B-11. A combination vehicle is two or more single vehicles operating as one unit (such as prime movers pulling semitrailers). One vehicle towing another less than 100 feet behind is also a combination vehicle (nonstandard). The sign on the front of the combination vehicle (towing vehicle or prime mover) has the letter "C" above the classification number of the combination (Figure B-7). B-12. The front and the side signs are circular and are marked in contrasting colors consistent with camouflage requirements. Black figures on a yellow background are normally used. The front signs are 9 inches in diameter, and the side signs are 6 inches in diameter. The figures should be as large as the sign allows. B-13. Place or paint the front sign on or above the bumper, below the driver's line of vision. When possible, place it on the right front (passenger side) of the vehicle. Place or paint the side signs on the right side of the vehicle facing outward (Figure B-7).